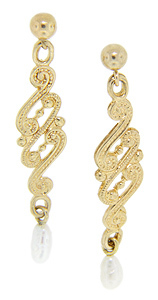 Looping gold designs decorate these 14K yellow gold antique style earrings. A single pearl dangles from the bottom of each earring. The earrings which are set on posts measure 1 1/2” in height by 5/16” in width.